The Nashville Predators will open their 2015-16 season at home against the Carolina Hurricanes on Thursday. 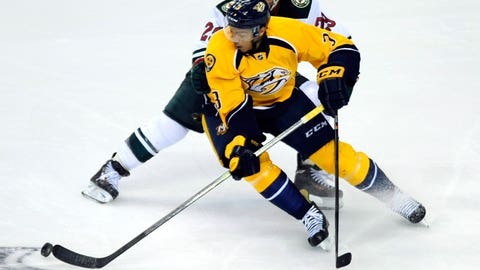 FOX Sports Tennessee will offer expanded coverage for its opening night telecast of the Nashville Predators’ 2015-16 NHL regular season. The team will open the season at home against the Carolina Hurricanes on Thursday, Oct. 8. New play-by-play announcer, Willy Daunic, will call the game, alongside analyst Stu Grimson. Lyndsay Rowley will complete the announce team as the rinkside reporter. — Player interviews with Rowley live on the Gold Carpet. — A special look at the Bridgestone Winter Park and 2016 NHL All-Star Game Fan Experience. — A one-on-one interview between Crisp and Predators second-year head coach Peter Laviolette. — An exclusive preview of the new gold helmets the Predators will wear on "Golden Saturdays" in 2015-16. — Live analysis from Grimson and Crisp alongside FOX Sports Carolinas analyst Tripp Tracy on the concourse at Bridgestone Arena. Immediately following the game, the Predators LIVE! postgame show will conclude FOX Sports Tennessee’s opening night coverage. This season, viewers will have a chance to win a pair of tickets to the 2016 NHL All-Star Game in Nashville by submitting fan photos to the FOX Sports Smashville Selfie sweepstakes. One winner will be selected per game between October 8 and February 13. Details and rules on how to enter can be found here. FOX Sports Tennessee will televise 78 Nashville Predators regular season games during the 2015-16 NHL season. Predators regular season games on FOX Sports Tennessee will reach more than 7 million households throughout Tennessee, Kentucky, Mississippi, Alabama and Georgia. Follow @FOXSportsTN for Predators news, updates and unique content.